While the body's ability to fight off viruses is impressive, its record-keeping also deserves applause. A human's blood keeps track of every virus a person has ever been infected with – and now you can find out your own history with just a single drop. The test, called VirScan, screens the blood for antibodies against the 206 species of viruses known to infect humans, according to astudypublished in the journal Science on Thursday. It was developed by Stephen Elledge, a professor of genetics and medicine at Brigham and Women's Hospital and Harvard Medical School, and colleagues at the Howard Hughes Medical Institute. The immune system boosts its production of pathogen-specific antibodies when it encounters a virus for the first time, and can continue to produce them for years – even decades – after the infection subsides. This allows VirScan to not only identify viruses the immune system is actively fighting, but also provide a history of past infections. Elledge and his team of researchers took blood samples from 569 people across the United States, South Africa, Thailand and Peru. To test the method, the team analyzed samples from people known to be infected with particular diseases. They found that the average person has been exposed to 10 of the 206 viruses. However, some showed exposure to more than double that amount. "Many of those [people] have probably been infected with many different strains of the same virus," said Elledge. "You could be infected with many strains of rhinovirus over the course of your life, for instance, and it would show up as one hit." The most common infections were herpes viruses (which cause cold sores), enteroviruses (which trigger upset stomachs), influenza, and rhinoviruses (which lead to common colds). Those in the US had been infected with fewer viruses than those in the other countries. Older people also had a longer list of viruses than younger ones. The team believes their findings could have important implications for vaccine design. It could also be useful in outbreaks of new viruses. In addition, it will allow scientists to “look at viruses and how they differ between populations of people, or people who have different diseases,” Elledge said. 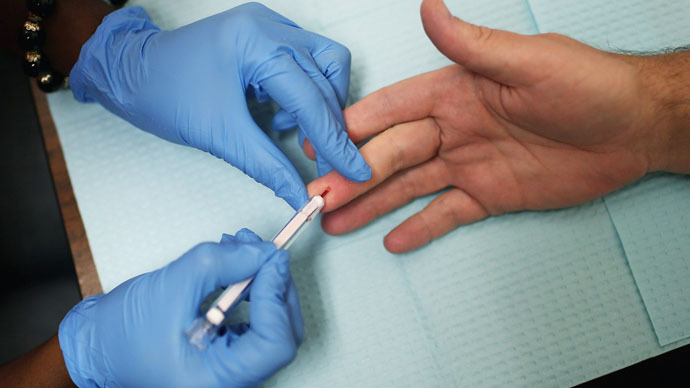 Elledge also hopes the test can be used to more quickly detect infections such as HIV and Hepatitis C, which people can carry for years without noticing any symptoms. VirScan may be useful in determining how the human virome – all the viruses in a person's body – affects our susceptibility to future infections or diseases, such as cancer. But the test isn't perfect – when VirScan tested for chicken pox, it was identified in only 25-30 percent of people. "That's much lower than you'd expect," Tomasz Kula, a graduate student working in Elledge's lab, told Wired. "Oftentimes people are vaccinated for it or had it when they were very young, and it wanes over time. So we know we're not the best when it comes to this,” he added. The test can be performed for about $25 per blood sample, Elledge said. However, labs might charge significantly more if it becomes commercially available. It currently takes two to three days to process and sequence around 100 samples, but that speed could increase as technology improves, he added.